2015 marks the 175th anniversary of Cunard Line, and they plan to mark the occasion with some very special events including all their ships meeting in Southampton and Liverpool. But it isn’t the first time the fleet of Queens have got together. While the original Queen Mary and Queen Elizabeth only were in port together a couple of times due to World War II, the beginning of what became known as a Royal Rendezvous has its roots in New York back on the 25th April 2004 when the brand new Queen Mary 2 met her illustrious predecessor, Queen Elizabeth 2. Following a tandem crossing, the Boston Cup was transferred to the new flagship in Southampton on the 1st May. The term, Royal Rendezvous, was first used in February 2006 when QM2 had a change of itinerary. She undertook a trip from Fort Lauderdale which included South America, California and Hawaii and would also be doing a three night roundtrip cruise from Los Angeles. 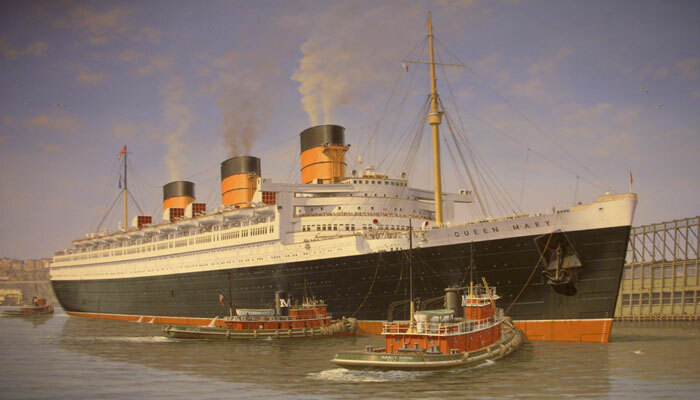 Originally, she was due just to visit Ensenada but someone had a brainwave and arranged for her to call into Long Beach the following day to visit the original Queen Mary, getting as close as her draft would allow before continuing on her itinerary. Since then, Queen Mary has been greeted by Queen Victoria in 2011 and the current Queen Elizabeth two years later. Both Queens together became a rare event in ports including Fort Lauderdale and Sydney. New York had the penultimate meeting of QE2 and QM2 when the former said goodbye during a tandem roundtrip shortly before retirement. With the addition of Queen Victoria in December 2007 and planned retirement of QE2 in November 2008, Cunard became more ambitious with their fleet meetings. The year began with QE2 and Queen Victoria setting off on their world cruises from Southampton, crossing in tandem to New York where they would steam with QM2 near the Statue of Liberty for sailaway fireworks. The Big Apple had another January rendezvous three years after the original. This time, Queen Victoria sailed in tandem with the brand new Queen Elizabeth where QM2 was waiting. 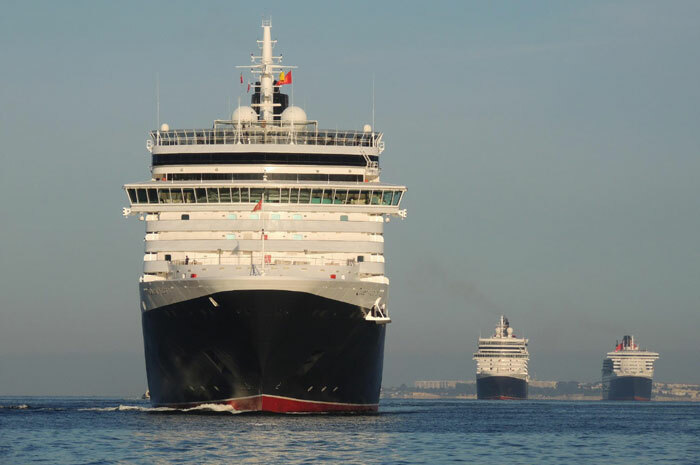 In May 2014, the Portuguese port of Lisbon had the pleasure of hosting all three Queens as part of QM2’s 10th birthday celebrations three days before they would all be in Southampton. Southampton has had the most fleet meets and from very humble beginnings, they have become an annual event. Two became the norm almost annually while the first with all three in April 2008 wasn’t originally due to happen. After the announcement they had sold QE2, the scheduled dry dock was cancelled. Instead she stayed in Southampton for a wet dock which resulted in her being alongside when QM2 and Queen Victoria returned. Her Majesty Queen Elizabeth II said goodbye to the ship she had named in June 2008 while QM2 was also in port. She ordered a cadet to blow the whistle at noon, which QM2 was supposed to respond to. After the introduction of the current Queen Elizabeth in 2010, Cunard publicised a meeting between her and Queen Victoria in January 2011 for their tandem crossing. However, they both greeted each other twice the month prior as Queen Victoria sailed for refit then returned. Since 2012 there have been two Queens in port in January for the world cruise departures. Also that year, the fleet got together twice less than six weeks apart. The first was to celebrate the Diamond Jubilee of The Queen while the other was the usual scheduled timings. Two years later, they all returned together, QM2 and Queen Elizabeth at the end of their world cruises while Queen Victoria was ending a normal cruise. And so we come to anniversary year. As usual, January fireworks sent off QM2 and Queen Elizabeth on their world cruises. Queen Victoria had hers following refit ten days afterwards. Queen Elizabeth went further than her prior rendezvous with the Queen Mary by actually docking in Long Beach in February, the first of the current Cunard fleet to do so. 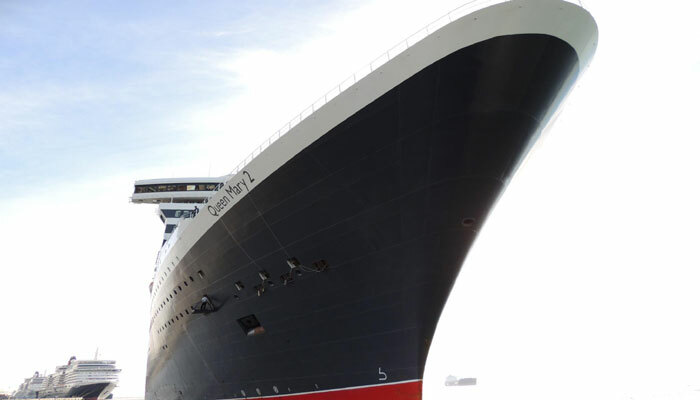 Queen Victoria and QM2 will be meeting in Sydney in March. The major celebrations begin when they all return from their world cruises. It’s going to be a very exciting year. Happy birthday Cunard Line!